The BTCC's visit to Knockhill was fast, furious, and at times controversial as the drivers engaged in some very close racing - at times too close. The NGTC (turbo) vs S2000 debate rages on too with some hailing the new cars as the future, and others as an unfair advantage. 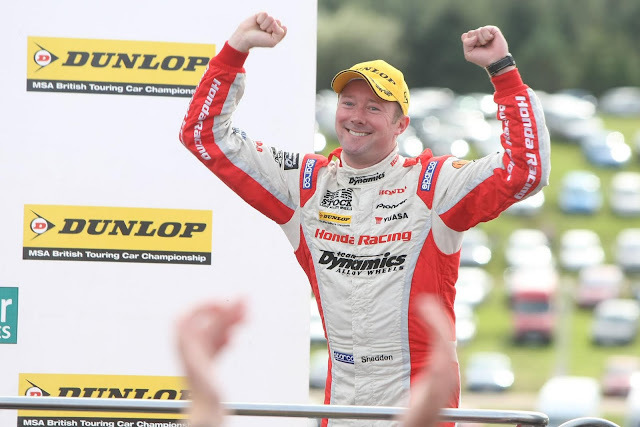 Local hero Gordon Shedden was the toast of Knockhill as the Honda Racing driver swept to victory on his home track and moved into the lead of the 2011 Dunlop MSA British Touring Car Championship on Sunday. The 31-year-old scored a third place finish in the opening race of the weekend at the Fife venue and then won the second race. He backed up those results with a fighting fifth position in the final race of the weekend to move to the top of the drivers' standings. He is just one point ahead of team-mate Matt Neal. Gordon ‘Flash’ Shedden, who is the commercial manager at the hillside venue, said that he thought it was mission accomplished over the course of the three races as he overturned a nine point deficit to seize the title advantage. "I knew it would be crucial to get at least 30 points over the course of the three races at Knockhill, and the results went better than I could have expected. I scored 32, and I was able to win a round in front of my home fans which is always special." Shedden said that the key strength of the Civic was its handling over the tight and twisty track, which he said gave him optimism for the remaining nine races in the championship. "We knew we had to exploit our chassis at Knockhill, and that is exactly what has helped us here," said Flash. "Some of the other cars have big turbochargers and were able to have an advantage on the straights, but our car came into its own in the corners. It shows what a great package we have with the Civic." 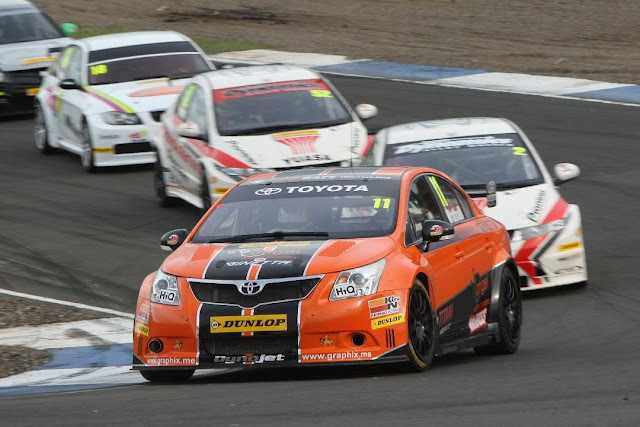 Shedden's team-mate Matt Neal backed up the Flying Scotsman's showings by taking two second places and a fourth to move into the slipstream of the new points leader. He racked up the points despite driving through the pain barrier last weekend. The former double champion fractured a bone in his hand in a martial arts exam in the weeks leading up to the race and was racing with his right hand strapped up while he was at the wheel. "It's funny, it didn't hurt all the while I was racing but it is starting to ache now the adrenaline is wearing off," said the 44-year-old. "We have had some amazing results this weekend and once again we have shown that the Honda is the best all-round package in the series. “To bounce back from the last meeting at Snetterton, where I had two non-scores, was vital in terms of the title run in. It is going to be a fight between myself and Gordon now for the rest of the season, but we aren't going to take our eye off the ball. There are so many competitive people in this championship and some really strong cars out there that we will have to keep pushing until the end of the season." Frank Wrathall took his Toyota to two podium finishes at Knockhill. Independent Toyota Avensis driver Frank Wrathall and his Dynojet Racing team produced a stunning performance at Knockhill yesterday to secure a brace of podium finishes in the latest rounds of the Dunlop MSA British Touring Car Championship season. Following on from his fourth-place finish at Snetterton last time out, which marked the first top 10 result for the new ‘Next Generation Touring Car’ Avensis, Frank and the Lancashire-based team made the trip to Scotland keen once again to challenge at the front of the field. Having run inside the top 10 in both of the wet free practice sessions on Saturday morning, Frank went on to take his best qualifying result to date to secure third on the grid for the opening race of the weekend. Despite being hit shortly after the start, Frank ran in a strong fourth place throughout race one and his Toyota proved more than a match for the works Hondas of Matt Neal and Gordon Shedden as the trio diced over second place. Frank took the chequered flag just outside the podium positions to match his Snetterton result. Race two proved even better for the 24-year-old as he again ran fourth before taking advantage of an error from leader Tom Chilton, who ran wide and allowed the two Hondas and Frank’s Avensis to move ahead. Once more giving chase to Shedden and Neal ahead, Frank crossed the line third for his maiden outright podium finish and the best result yet for a car built to the NGTC rules. The race also saw Frank secure Independent class victory for the second time this season, and also set the fastest lap. 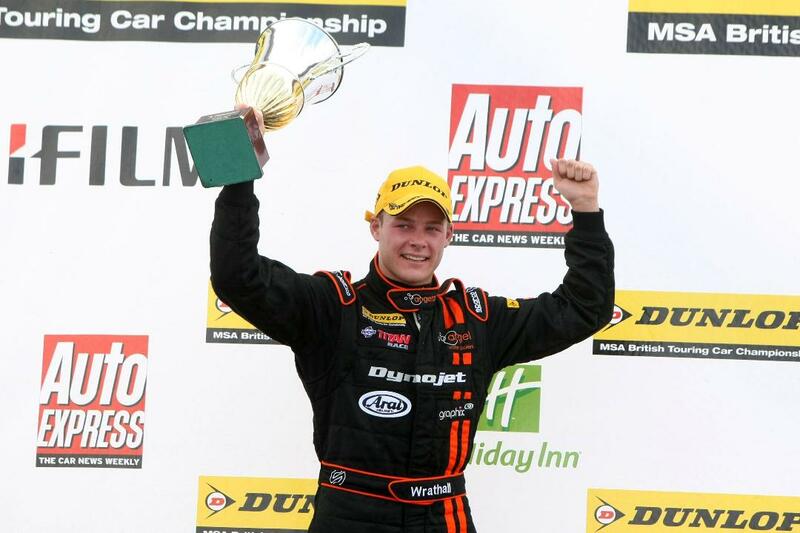 Wrathall celebrates his best result to date - and his maiden podium! From fifth on the grid for race three thanks to the ‘reverse grid’ draw, Frank held his position early on before inheriting fourth when Jason Plato went off on lap four. Frank then slotted into third with a move on race one winner Chilton at Scotsman corner, and successfully brought the Toyota home for his second podium finish of the weekend. “I really feel like I’m a BTCC driver after this weekend,” said Frank. “We mixed it towards the front of the field in all three sessions on Saturday despite changing weather conditions and then we’ve been right in the mix throughout race day. Taking two podium finishes - and setting a fastest lap - is a fantastic achievement for the team at this stage of the programme and it shows that the result we picked up at Snetterton last month was no fluke.